Rodney Smith, Jr. (pictured, right) started mowing the lawns in Huntsville, Alabama last fall, using his time between classes at Alabama A&M to reach a goal of mowing 100 yards before winter. Rodney Smith, Jr., who started mowing the lawns in Huntsville, Alabama last fall, using his time between classes at Alabama A&M to reach a goal of mowing 100 yards before winter. Smith has been cutting grass for free to help single moms, the elderly, and disabled, while teaching local youth the values that can turn boys into men. 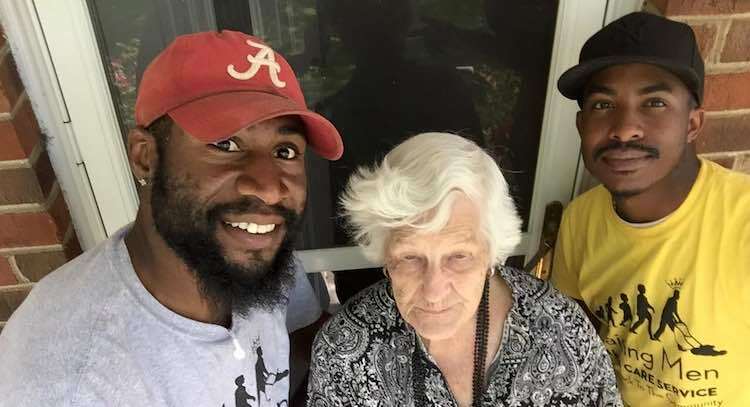 Last month he was getting ready to launch his mowing service for the summer, when he heard about this 93-year-old woman in the photo trying to cut grass by herself. Smith and a friend showed up to do the job for her. “Have no fear, Raising Men Lawn Care is going to make sure her lawn is done every two weeks!” he wrote on his Facebook page. In November, when a local TV station gave him $300, calling it a “pay it forward” gift for his good work, he used it to create the non-profit service group, Raising Men Lawn Care Services. He also launched a crowdfunding page to buy lawn equipment and other supplies — including t-shirts emblazoned with a logo to promote unity and pride. Smith says he is using his free lawn services to teach teens “a sense of accomplishment, self-esteem, moral value and purpose in themselves.